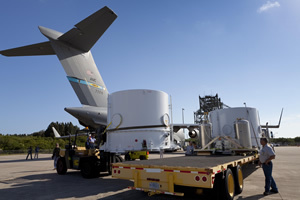 NASA’s twin Radiation Belt Storm Probes (RBSP) safely arrived today at 7:54 a.m. EDT at the Kennedy Space Center, Fla., where they are scheduled for an August launch to begin their mission to study the extremes of space weather. 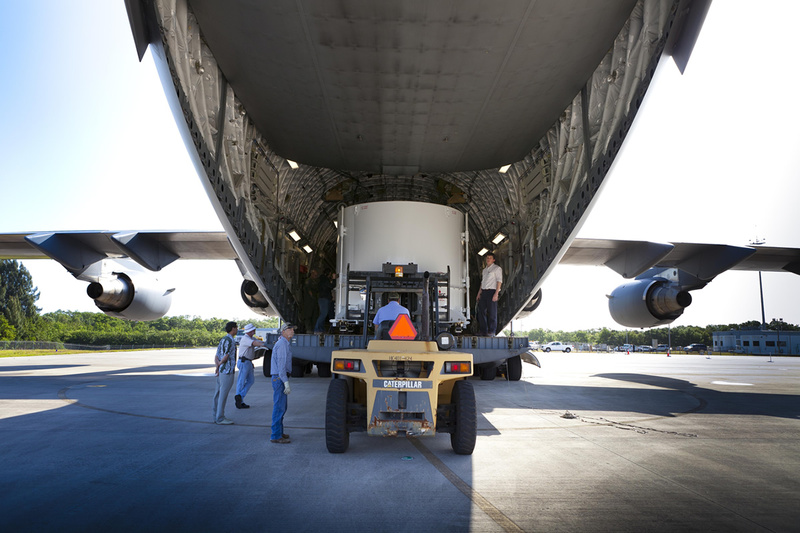 Just after 10:30 p.m. EDT on Monday, April 30, the RBSP spacecraft departed the Johns Hopkins University Applied Physics Laboratory (APL) in Laurel, Md., where they were built for NASA, packed in custom-made shipping containers. 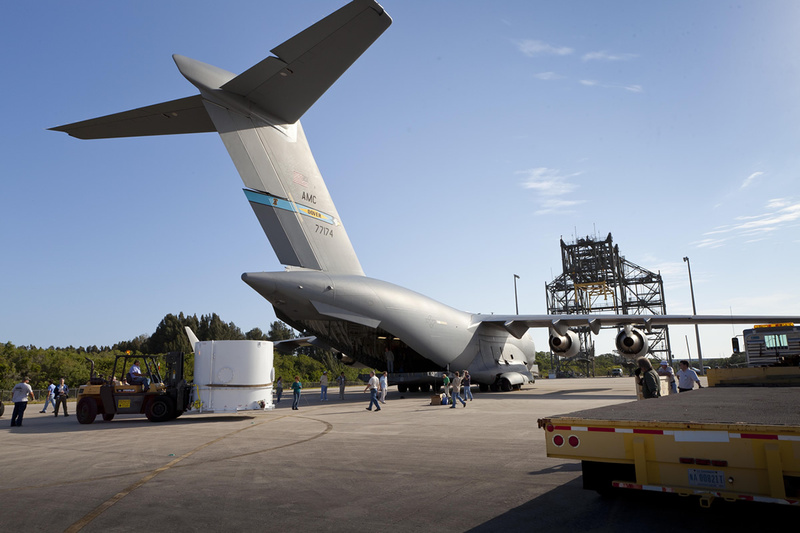 They arrived at Andrews Air Force Base, where a United States Air Force C-17 cargo plane waited to transport them to Kennedy on May 1 for the start of launch processing. Over the next several weeks, engineers and scientists from APL will prepare RBSP for launch in Florida. Other team members will continue to test the spacecraft’s ' key operating systems remotely from the RBSP Mission Operations Center at APL. For the past six months, teams of engineers and scientists have been putting the RBSP spacecraft through rigorous temperature, vibration, and stress testing designed to ensure they will operate flawlessly during and after launch. RBSP will begin its exploration of Earth’s Van Allen radiation belts with a predawn launch scheduled for Aug. 23, aboard a United Launch Alliance Atlas V 401 rocket. Each RBSP spacecraft weighs approximately 660 kilograms (1,455 pounds), and carries an identical set of five instrument suites that will allow scientists to unlock the mysteries of the radiation belts that surround our planet. The two spacecraft will fly in nearly identical, eccentric orbits that cover the entire radiation belt region, lapping each other several times over the course of the two-year mission. This will give researchers an unparalleled view into the mechanics and processes that change the size and intensity of the radiation belts over time. RBSP will explore space weather – changes in Earth’s space environment caused by changes in the sun’s energy flow – and especially its extreme conditions, which can disable satellites, cause power grid failures and disrupt GPS services. The RBSP mission is part of NASA’s Living With a Star program, which is managed by Goddard Space Flight Center in Greenbelt, Md. APL built the RBSP spacecraft and will manage the mission for NASA. More information on RBSP is available at http://vanallenprobes.jhuapl.edu/ and http://www.nasa.gov/rbsp.